This morning I participated in my first Birdathon to benefit the Audubon Society of Portland. I joined the team Whittemore's Whatzits after being invited by one of my first blog friends, Michele of Nature Nut Notes. 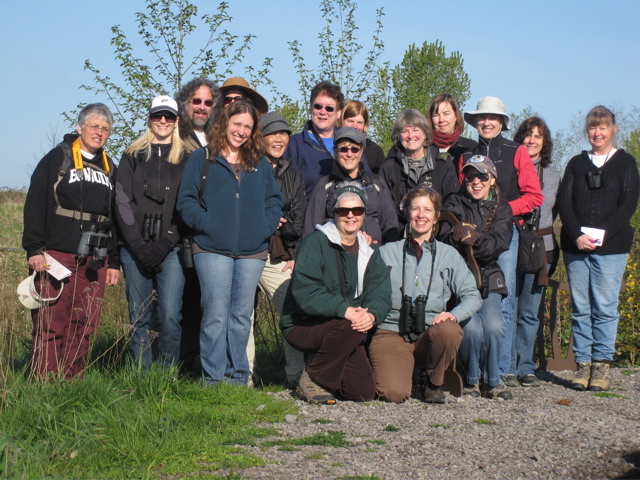 We birded Steigerwald National Wildlife Refuge in Washington from 8:00 a.m. until about 1:00 and counted 56 species! It was my first experience birding with a group and I was a bit nervous about it... But I definitely had nothing to worry about- everyone was super nice, including our group leader, Laura Whittemore, who was another one of my first blog friends. Laura took great care of us, including keeping us energized with teeny Snickers and Mr. Goodbars! It was an absolutely beautiful day, long overdue for the northwest. One of our first treats was seeing a Great Blue Heron snag a snake out of the grass and gobble it down. This is not the first time I thought I was in a photo and realized later that just the top part of my face made the cut. Ah well! It was so much fun to bird with people who actually know what they are talking about (plus maybe a couple who didn't) and I look forward to more group birding adventures! Oh and I think our team raised at least $2000 for the Portland Audubon Society! Oh Jen, what a great review! I'm glad you're not sworn off group birding :) and I very much like your sly comment at the end about people who maybe don't really exactly know what they're talking about. There's always one in every group, guaranteed. Thanks so much for coming and perhaps we can do it again sometime! Jen, Great photos! You capture action well with words and images. As Laura's sometimes birding companion, I really missed sharing the experience (and snickers). Great post with some super shots!! That Canada Goose looking at you is really funny!! Boom & Gary of the Vermilon River, Canada. Nice photo! You have a nice birding day! What a great bird outing Jen. Wonderful work for the group counting 56 species. As always, you have photogrpahed a nice variety of birds. My fav's are the Osprey in flight, the close up of the goose in the snag, and the wren shot. Great work! What a fun trip - we did our first group outing last month, we had a blast. Beautiful photos as always! The goose peering over the stump made me laugh! Hey Jen- I posted a couple of people photos on Audubon's facebook page. If you are on facebook, you should check it out. One is of you walking head turned looking for birds. By the way, my e-mail is nwnaturenut@gmail.com. Drop me a note and we can arrange an outing sometime soon. It was so fun to meet you! And fun to see all your photos of the day. You got some great shots as always! Looks like a fun time with the group birding. Loved the photos. Cool sighting of the Bittern.